The Bumgarner Best Small or Miniature Flower Award, originally known as the Louise Williams Memorial Award and then as the Reggie Register Best Small or Miniature Flower Award, is currently sponsored by the Raleigh Hemerocallis Club. The Raleigh Club renamed the award to honor “cherished members,” Tom and Marie Bumgarner: in memory of Mrs. Bumgarner and in recognition of their many years of outstanding service to the Raleigh club. The winner of this award is selected by registered attendees of the Region 15 summer meeting as a part of the garden tours. 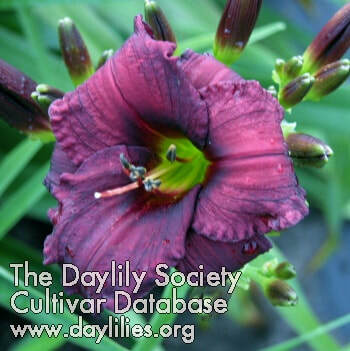 Any daylily classified as small or miniature flower is eligible for consideration—not just those hybridized by members of Region 15. Cultivars must be accurately labeled with the name of the cultivar and the name of the hybridizer to qualify for consideration. Attendees will be provided with ballots for this award. Ballots will be collected by the Awards Management Chair at the end of the garden tours and will be counted prior to that evening’s awards presentations. The garden owner(s) who grew the winning daylily will receive an appropriately chosen award presented by the president of the sponsoring club, or the president’s designee.